Offering you a complete choice of products which include logic controllers and panel mounting controllers. This Panel Mounting Scales operates at 230Vac +/- 10%, 50Hz power supply. It comprises of a 13mm red LED or LCD display and a keypad with tactile keys to enter calibration, configuration, time delay in process, limit settings etc. It also has a crystal clock with 5000 to 10000 display resolution and 16 bit internal resolution. 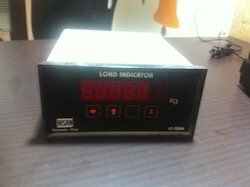 This micro controller based weighing scale has sigma delta A to d conversion. This scale has three relay out puts for LO & HI out limit range, within limit range and beyond capacity range to protect load cell from overload. We also manufacture clamp mounting and rail mounting models of electronic weighing scales.